The new CCP 611 and CCP 621 processor modules from Sigmatek stand high performance. With integrated EDGE-Technology (800 MHz, 32-bit architecture), 128 MB DDR2 RAM and an internal memory of 512 MB provided by a microSD card, a high data volume can be managed. Since the modules run control programs, they are an important component of the automation system. With the integrated DC/DC converter, all the modules on the C-DIAS module carrier are supplied with power. As online interfaces: CAN bus, Ethernet and USB device (Mini USB) are provided. The CCP 621 also has an S-DVI interface for terminals with a resolution of 1024 x 768 pixels. A 7-segment display and 2 status LEDs provide information on the actual status of the CPU. For program updates, an integrated USB host interface can be used. Using the exchangeable microSD card, the complete control program can be easily changed. 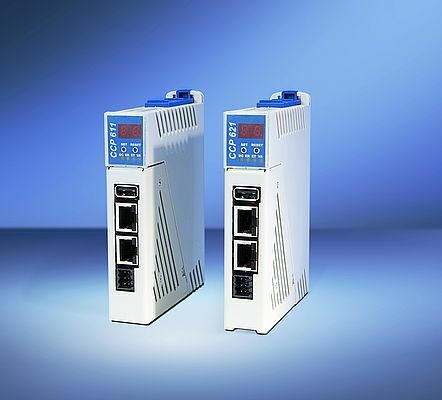 With the integrated VARAN manager, the CCP 611 and CCP 621 offer the possibility to construct a high-performance VARAN system to operate for example, decentralized I/O modules, drive systems or communication modules.